Founded in 1954, Lutz Pumps has concentrated its efforts on the narrow but specialist field of drum and container pumps. 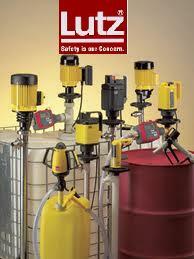 By problem analysis, Lutz has always brought innovative technology to drum pumps. Responsibility for efficient, yet safe working conditions, for health and the environment, is not a question of quick solution, but an obligation for Lutz. What is important to them is that the final solution is safe, effective and long lasting. Modular design for interchangeability between motors & tubes. Progressive cavity models available for high viscosity applications. High flow/low head and low flow/high head impellers available. Complete drainage tubes and mixing tubes available.